I’ve been to so many magical weddings and memorable events at the Grand Hills Hotel overlooking Beirut in Broumana over the years. However, it wasn’t till recently that I actually spent a weekend up there. I was quite lucky too, since the entire complex has been recently refurbished. 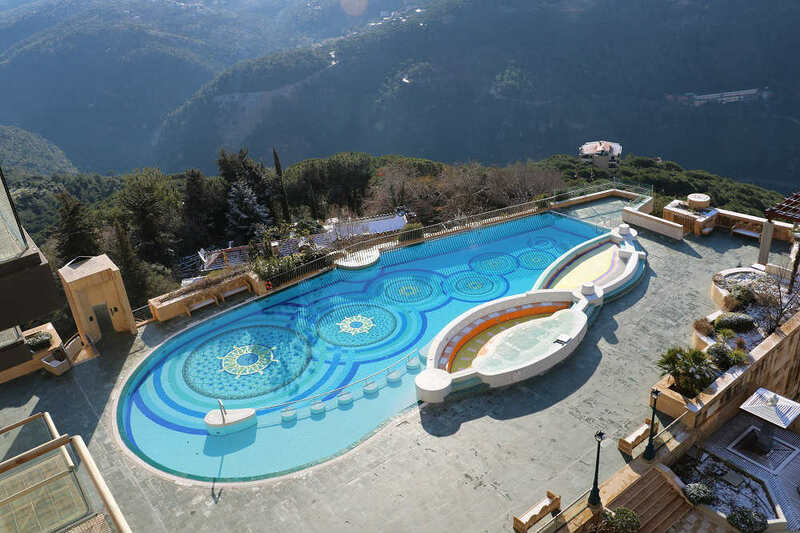 The Grand Hills Hotel is a massive luxury hotel and resort nestled on a hilltop in the picturesque town of Broumana just a 30-minute drive from Beirut. Calling it just a hotel would be an understatement, given it includes over 1000 paintings, sculptures and antiques pieces. 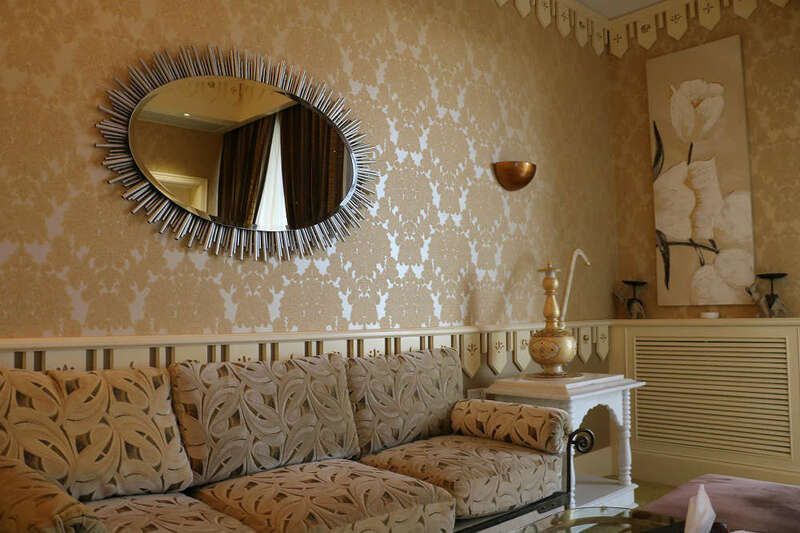 It also consists of 164 suites, rooms and furnished apartments. A little know fact is that it also features the world’s largest suite, as per the Guinness Book of World Records. 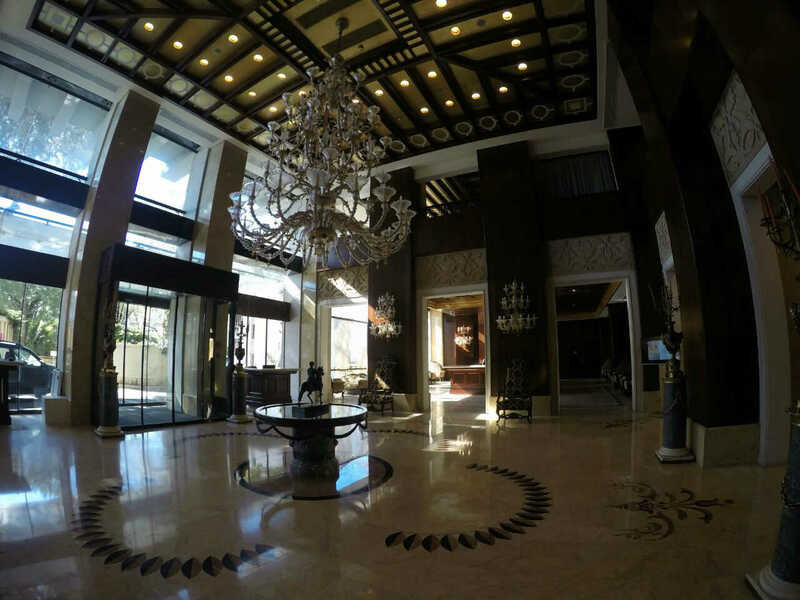 The Royal Residence suite is over 4000 square meters. 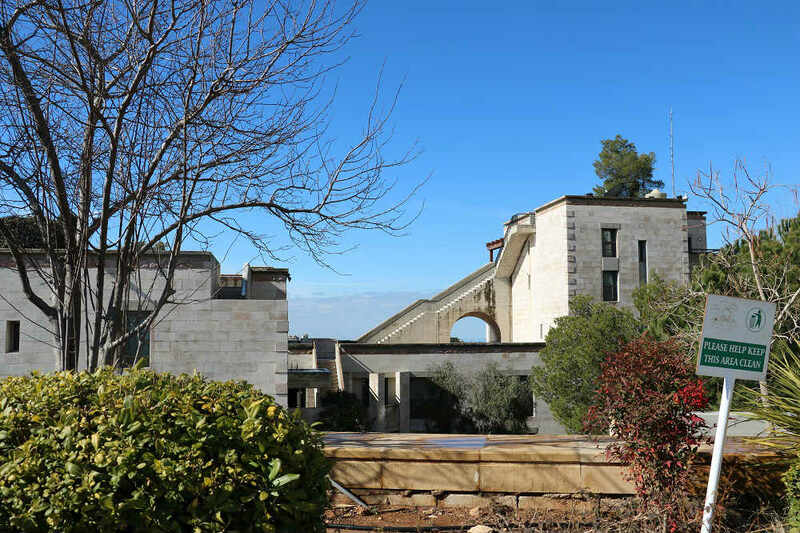 Apart from all that, it also features 13 meeting and conference spaces as well as a fully-equipped amphitheatre. I spent the weekend in one of the hotel’s Designer Suites located on the 6th floor. With Valentine’s Day quickly approaching and ski resort towns fully booked, The Grand Hills was the perfect place to spend a quiet, romantic weekend in the mountains with breathtaking views from all sides. Perhaps one of my favorite features about the hotel is its location. Broumana is a gorgeous town with plenty to see and experience. 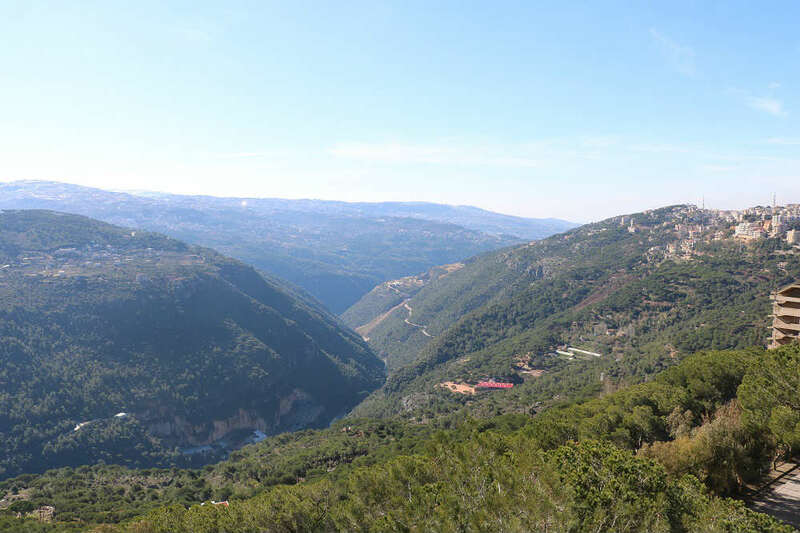 Its narrow streets with beautiful traditional Lebanese architecture are littered with iconic restaurants, pubs and cafes, separated by awe-inspiring palaces and villas surrounded with pine trees as far as the eye can see. 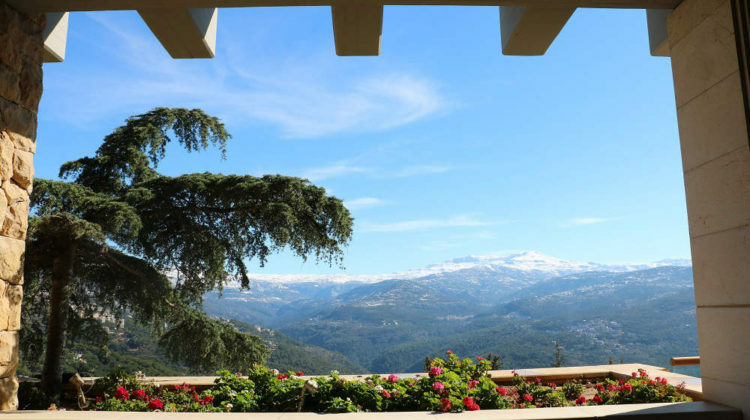 I highly recommend you take a stroll around the hotel grounds, then venture out into the town and discover the hidden gems that make Broumana one of the top spots for mountain escapes in Lebanon. Visually, it’s hard to describe how satisfying the views are. 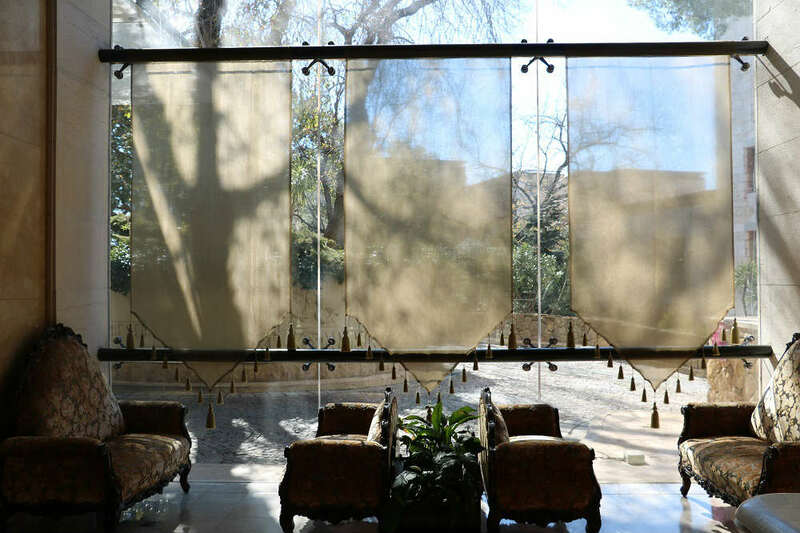 Wherever you are in the hotel, you have picturesque views outside the window, whether it’s overlooking the Mediterranean Sea and Beirut, or looking up eastwards towards Lebanon’s western mountainous chain. 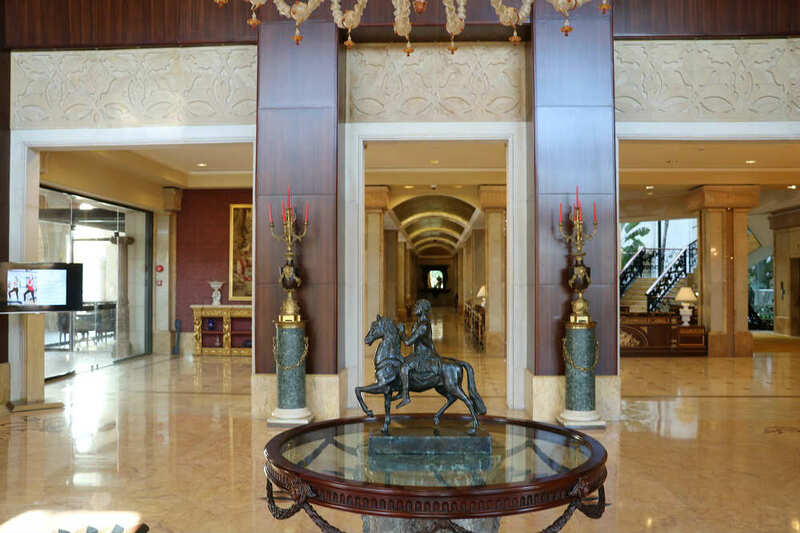 When your eyes aren’t wandering outside, there’s plenty to enjoy and discover in the hotel’s halls and indoor areas full of museum-like works of art and antiques. The Grand Hills is massive enough that it could be considered a small village in its own right. However, everything was spotless and very well-maintained. Even the sections that were closed off for the season, such as the pool area, were very clean and in impeccable shape. The chill-out areas, bars, restrooms, halls and restaurants were also extremely clean and well-kept. Now, for the most important part when it comes to cleanliness: the room. Everything was fresh and clean, with an exquisite smell, neat carpeting and glistening bathroom. 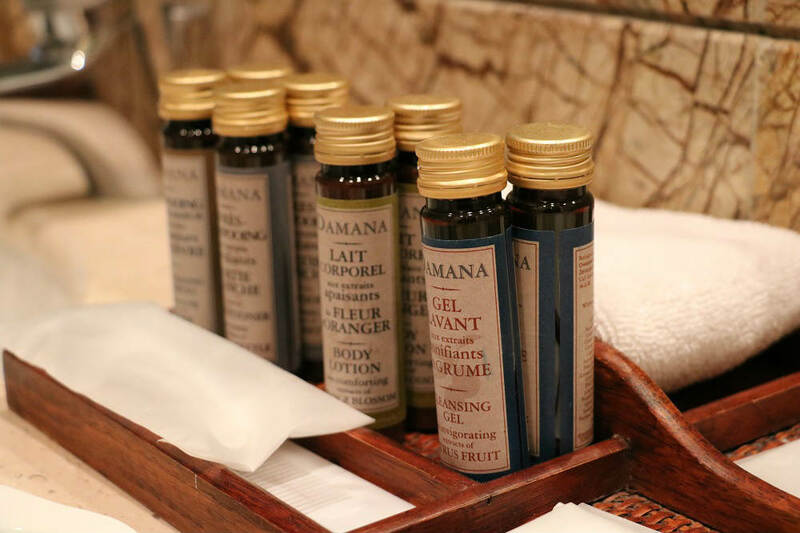 The amenities are everything you’d expect from a 5-star hotel which go beyond just a generic shampoo bottle and conditioner. If you’re looking for a weekend getaway, far from the busy, noisy city life with either your significant other, friends or family, then Grand Hills is a perfect option. Most of the rooms have their own balcony, with comfortable patio furniture and views that will have you staring into the distance for minutes in silence. It’s also very spacious, whether the rooms themselves, the bathrooms, the living quarters and even balconies, you don’t feel the crampedness you often get when checking into a hotel. 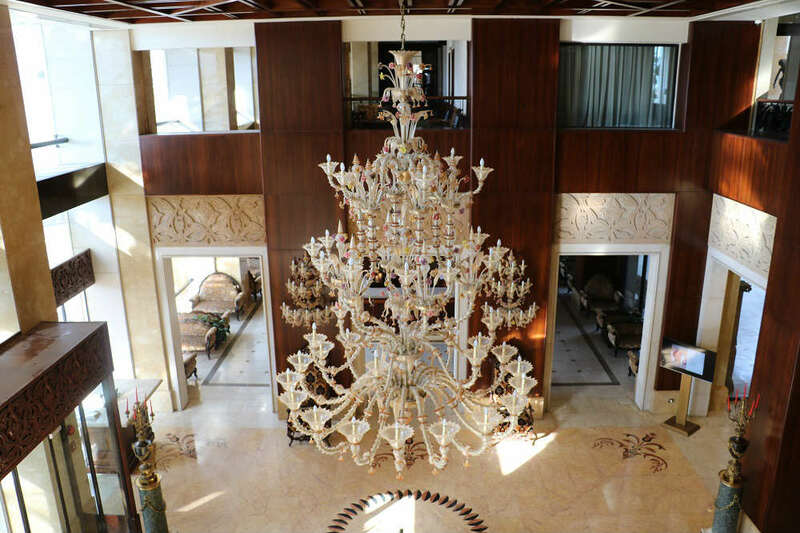 Grand Hills has everything you’d expect a luxury 5-star hotel to offer. It includes several pools, 3 of which are private pools adjunct with their own suites. The main outdoor pool overlooks the pinewood pedestrian village, with a gorgeous mountain backdrop on the other side. The indoor pool is right next to the gym, and is open 24/7. There’s even another indoor pool in the spa area as well. The Spa features 12 treatment rooms, 4 Balneo chromatherapy rooms, 4 body peeling rooms and 4 suites for a duo massage that include a private jacuzzi. The Spa also includes a beauty salon, 2 saunas and 2 steam rooms. 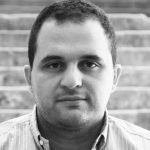 I had a massage session, and even though it wasn’t the best I’ve had in Lebanon, it helped me relax and the staff were very professional and courteous. The one thing I had reservations about was that I needed to go across and outdoor area to access the spa, which is not very convenient in chilly winter weather. After all, after a relaxing spa session, you wanna curl up in bed and relax, not cover yourself up and sprint across to avoid getting a cold. The bars in the lobby of the 35,000 square meter hotel weren’t staffed during low season, and the only restaurant offering food and drinks was the one on the first floor during my stay. As soon as we pulled up in front of the hotel, there was an attendant waiting for us to help us out of the car and park it for us. We were greeted politely and the front desk clerk checked us in in no time at all. I did have to fill in a lot of papers though, and my wife had to present her ID, something that is unfortunately standard procedure in Lebanon. Soon enough though, we were being escorted to our suite. The hotel staff were amazing, going out of their way to make sure we were enjoying ourselves. They called us twice to make sure everything was in order, and completed several special requests we had in our two days spent there in a timely fashion and perfectly. The food was good, but not great. We booked a dinner at Chez Alain, but since Brian was giving us a hard time, we decided to wait till he was in bed and ordered room service. 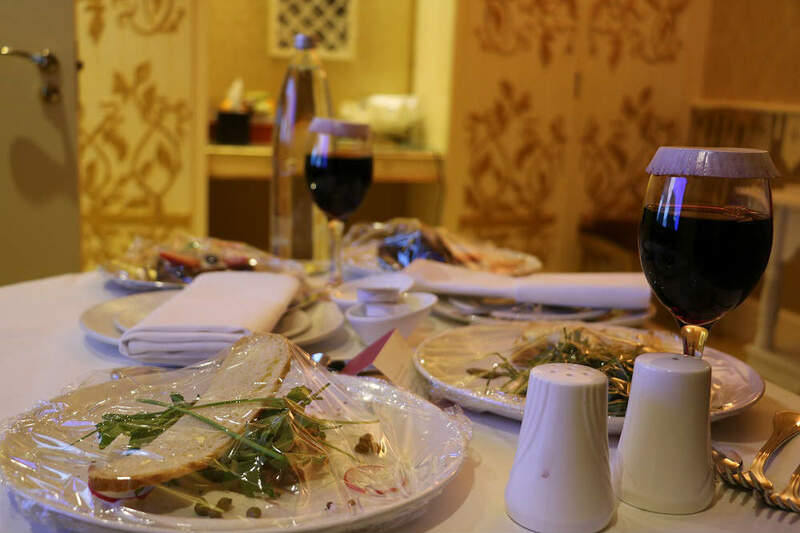 The service was impeccable, our server was very professional and the dishes were very well-presented and served. 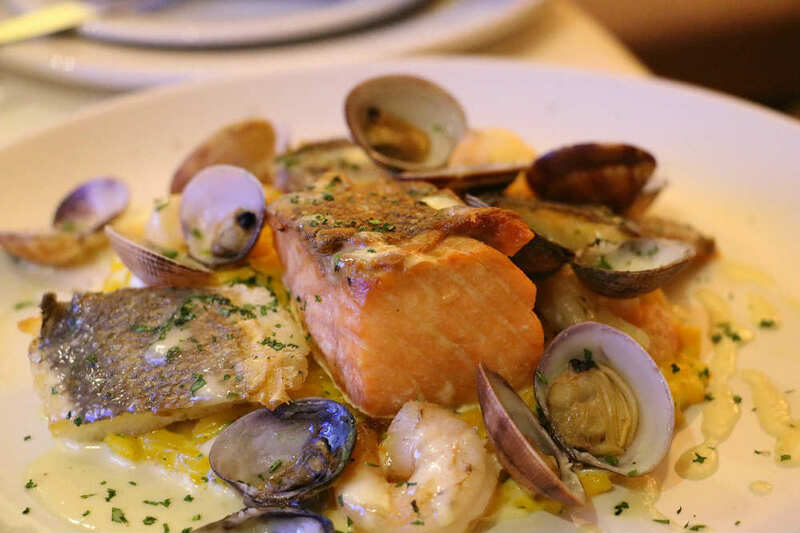 I loved the grilled salmon, which came with a side of risotto. The meat we ordered was quite good as well, but the appetizers were somewhat disappointing. The goat cheese tart and the the salmon tartare were a bit bland and somewhat too salty. The desserts were good, but again, we weren’t as impressed as we were with the salmon and beef. I enjoyed the pain perdu more than the chocolate mousse personally. The fruit salad was delicious though! Breakfast selections was a bit less than the typical hotels of the same caliber I’ve stayed at. They offered fresh croissants, manakish upon request. There was an assortment of cheese and charcuterie on offer as well. It was great, but not as rich and diverse as we had expected. 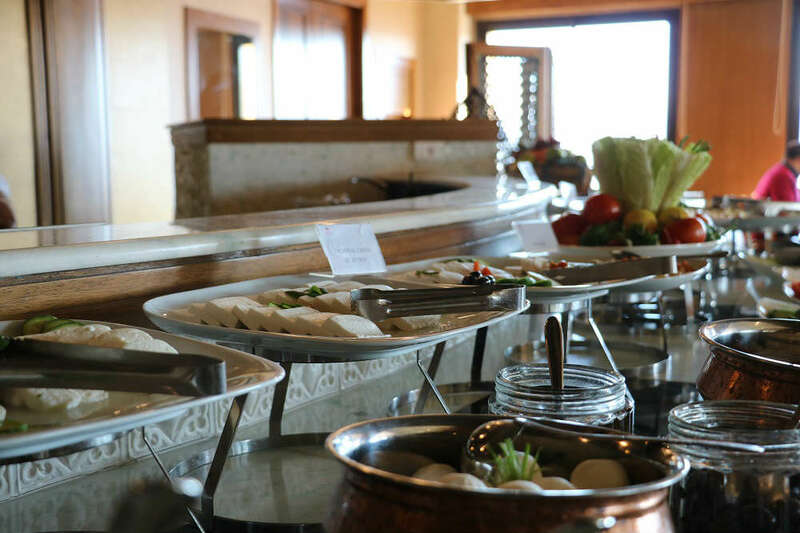 There are several restaurants on the hotel grounds, which include: Chez Alain, Shisha Hills, Pool Café, Grand Hills Bar, and Pasquale (closed for the season). The Grand Hills Hotel is a 5-star luxury hotel and resort, so keep in mind the prices aren’t as affordable as a budget hotel you browse through on Booking.com. 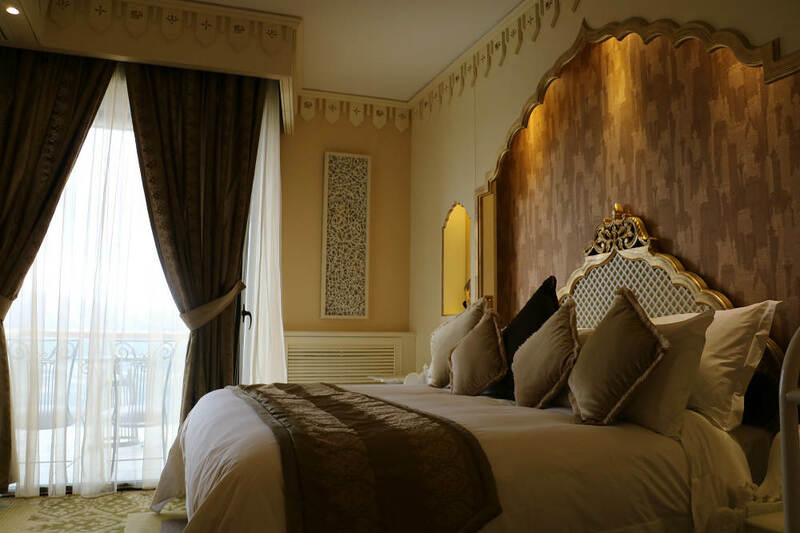 Superior and Deluxe rooms start at 230USD and suites start at 430USD, with the Royal Suite at 5,000USD. As for the Royal Residence, the world’s largest suite I mentioned earlier, can cost up to 80,000USD per night and includes 3 pavilions, 2 private pools and 7 floors of exquisite art, sculptures and specially designed quarters. Of course, The Royal Residence is targeted towards foreign monarchs and huge celebrities who can afford such a night (I’m hoping to take a look at it soon and snap a couple of pics myself). 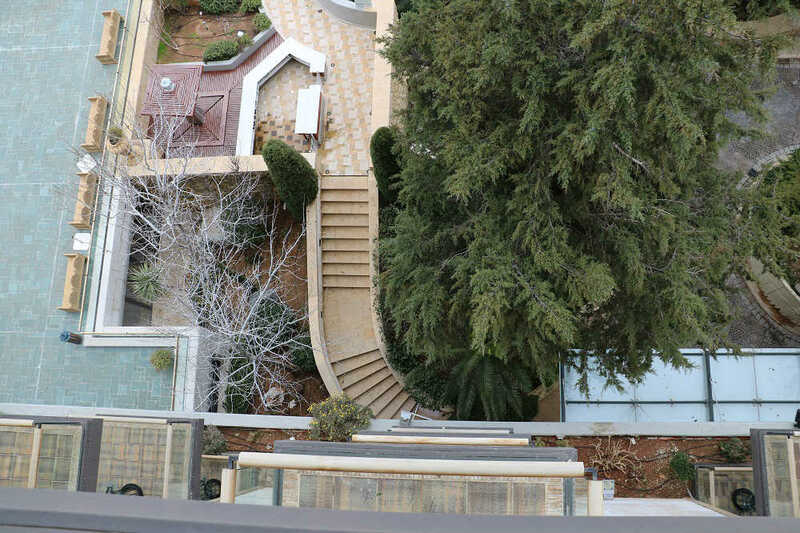 All in all, Grand Hills is expensive, but then again, there aren’t many, if any that is, hotels of the same caliber in Lebanon. The amenities, experience and service is worth it if you want to impress your significant other this Valentine’s Day, and I hope my review helped you get an idea of what it’s like. Check out their Valentine’s Day special [here].